Naming an endowed Chair or Professorship at the Rotman School will help recruit and retain the world’s leading teachers and researchers, enhance our curriculum, foster research and advance the academic performance of tomorrow’s business leaders. Chairs and Professorships can be established for a $3 million Named Endowed Chair, a $1 million Named Expendable Chair, a $1 million Named Endowed Professorship and a $500,000 Named Expendable Professorship. of investments in program development to maximize the intellectual capital generated throughout the University’s academic community. 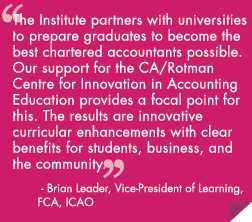 Rotman has responded by developing centres for excellence. 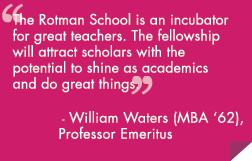 These centres bring increased focus and intensity to the education of today’s Rotman graduates. The centres of excellence are essential to the ongoing development of the School’s academic programs. Endowing each of these programs will enable the School to provide an innovative and progressive business education that continues to compete with the best in the world. 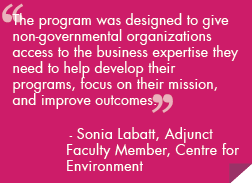 Among our many donors, Marcel A. Desautels, Sandra Rotman, and Joseph Rotman have played visionary and transformational roles in the Rotman School’s evolution into an international forum for management education and research. Learn more about our donors. View a list of donors and their cumulative pledges since May 1, 2006 (the start of the Rotman School's $200-million campaign).